Not to be confused with Stradivarius or Stratocaster. Stratovarius is a Finnish power metal band that formed in 1984. Their material contains elements of power metal and symphonic metal. To this day the band has sold over 2.5 million records worldwide. They have been since the 80's, alongside with Helloween & Blind Guardian, one of the pioneers and most influential bands of Power Metal. Stratovarius was founded in 1984 in Finland under the name Black Water. The founding members were Tuomo Lassila, Staffan Stråhlman, and John Vihervä. In 1985, the name was changed to Stratovarius (a portmanteau of Stratocaster and Stradivarius), an idea of Lassila's. In 1985, Timo Tolkki joined the band, replacing Stråhlman on guitar, as well as contributing vocals and assuming most of the songwriting. He brought along not only strong rock influences, but also a neo-classical style. The band released a demo to various record companies by 1987 and was picked up by CBS Finland. In 1988, they released their first two singles, "Future Shock" and "Black Night," followed by their 1989 debut album Fright Night. Their "Future Shock" single was filmed the same year, becoming their first music video. After being dropped by CBS, the band went through several member changes, but in 1991 they managed to release the album Stratovarius II on Bluelight Records, which was re-released as Twilight Time through Noise Records the next year. The album was followed by one single, "Break the Ice," in 1992. In 1994, Stratovarius released their third album, Dreamspace, featuring new bass player Jari Kainulainen, who joined the band when 70% of the new material was already recorded. The band had a following single called "Wings of Tomorrow. After an arm injury, Tuomo Lassila was temporarily replaced in the recording by session drummer Sami Kuoppamäki. Tolkki decided to stop singing for the band, and they hired a full-time singer, Timo Kotipelto. The release of Fourth Dimension in 1995 was a huge success for the band. The song "Against the Wind" was filmed without any single support although, this time, no singles were released for the album. Despite the success of Fourth Dimension, internal differences - particularly of the style the band was going for - prompted the departure of long-time drummer Tuomo Lassila, the band's last founding member, and keyboardist Antti Ikonen. Two new non-Finnish members were recruited: Swedish keyboardist Jens Johansson (of Yngwie Malmsteen fame) and German drummer Jörg Michael from Running Wild. With the fifth release Episode in 1996, Stratovarius had finally found its sound and had a strong, diverse line-up. Episode featured a large choir and a string orchestra. It was another commercial success. It resulted in two new singles, "Father Time" and "Will the Sun Rise?." Their next studio album, Visions, was released in 1997 without changes in line-up, and together with it came two singles, "Black Diamond" and "The Kiss of Judas." Both of these were filmed. 1997 also saw the release of their first compilation album, The Past and Now. Destiny was released in 1998, and Infinite in 2000. With these albums, their fame and fan-base expanded, and they started gaining a stronger following outside Scandinavia, particularly in Japan. While Destiny only resulted in one single, "SOS," Infinite resulted in three: "Hunting High and Low," "It's a Mystery," and "A Million Light Years Away." In 2000, Stratovarius toured with Sonata Arctica and Rhapsody of Fire. In these years, Stratovarius also released three new compilation albums: The Chosen Ones in 1999, 14 Diamonds in 2000, and Intermission in 2001. In 2003, the band released its most epic project yet, the two-album suite named Elements. With these albums, they reached a peak in their progressive and symphonic style of power metal. The first album, Elements, Pt. 1, was released in early 2003, followed by a world tour. The same year, it was followed by Elements, Pt. 2, both released on Nuclear Blast. In late 2003, the band broke up, with Timo Kotipelto and Jörg Michael leaving after a very vaguely-explained conflict. Tolkki hired a new singer, Katriina "Miss K" Wiiala, and Anders Johansson of Hammerfall (Jens' brother) temporarily on drums. The rest of 2004 saw almost complete silence from the band. Despite the break-up, the band still had to finish off their Elements tour. While touring in Spain, Tolkki was announced to have been attacked by a furious fan. Rock magazines and tabloid papers showed pictures of the stabbed guitarist. However, some time later news begun to spread that no stabbing actually happened. Around the same time, Tolkki was hospitalized because of severe mental illness. It was later revealed by Keyboardist Jens Johansson on the band's forum that the break-up never happened, and that Miss K and Anders were hired as a publicity stunt to generate buzz around the band. The stabbing was also reported to have been a publicity stunt. In January 2005, it was announced that Stratovarius had reunited with the former line-up. In June 2005, Tolkki announced that the band's bassist, Jari Kainulainen, had left the band due to personal reasons. He was replaced by Lauri Porra, a young Finnish musician. Stratovarius then released the self-titled album Stratovarius in September 2005. During this time, Stratovarius began a world tour, starting in Argentina, which included a North American leg, where they toured the United States and Canada for the first time in the band's history. They played at such events as Atlanta's ProgPower, and in well-known venues such as B.B. King's House Of Blues in New York and Philadelphia's Trocadero Theatre. The tour also included European and Japanese cities. After a long period of silence, on March 4, 2008, Timo Tolkki officially stated the break-up of Stratovarius on his site. Internal tensions within the band were cited as the cause, saying that Lauri Porra and Jens Johansson were his only supporters, Jörg Michael was more focused on his session work, and Kotipelto was best for having a band by himself. The band was planning to release a new studio album, codenamed R.... R....., in 2008. Instead, however, Tolkki will be releasing the album himself in June 2008, and will be forming a new band around the album, called "Revolution Renaissance". The remaining members of Stratovarius, however, posted a statement online giving their side of the story. They concluded by saying that the band was very much alive, but that Tolkki will no longer be a part of it. 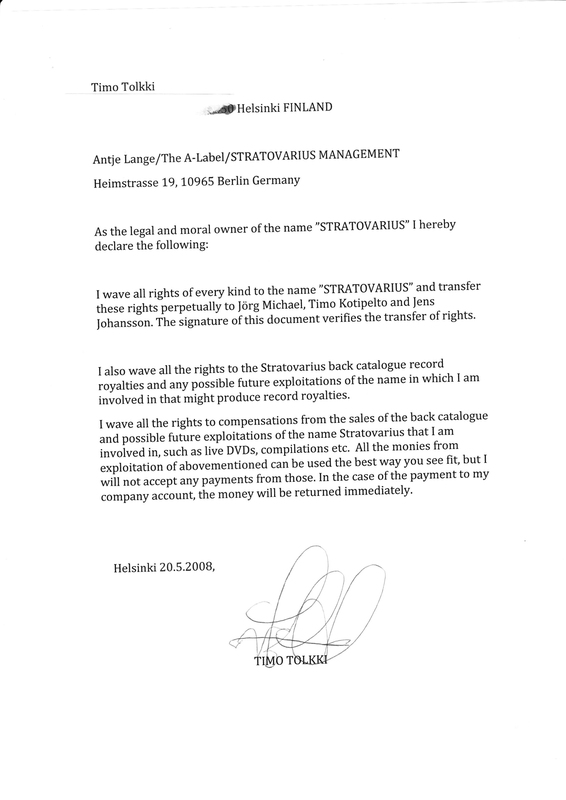 Tolkki rebutted with another statement online, his final statement, wherein he waived the rights to the Stratovarius name, as well as all profits from their back-catalogue. Since Tolkki has written 95% of all Stratovarius songs since 1989, the continuation of the band without Tolkki would almost certainly change the musical direction of the band. On August 22, Stratovarius announced that the new guitarist would be Matias Kupiainen. Over fifteen new songs were written and recorded as demos for the new album. In February 2009, Stratovarius announced the upcoming release of Polaris, which was in fact released on May 21, 2009. The album's accompanying tour commenced in May 2009. On April 29, 2009 Stratovarius released their 1st single for Polaris titled Deep Unknown. The single includes the songs Deep Unknown and Higher We go as well as Deep Unknown official music video. On September 30, 2009 a Stratovarius concert at the Starlite Room in Edmonton, Alberta, Canada ended in flames when a ceiling mounted PA speaker caught fire. The concert stopped and the fire alarm went off, the building was immediately evacuated, no casualties occurred from this incident and the fire was quickly put out. Stratovarius plans to finish the Polaris world tour with summer festivals in 2010 and then begin work on their next album. Stratovarius has confirmed to be part of the Wacken Open Air tour held in Wacken in Schleswig-Holstein, northern Germany. This is one of the biggest summer heavy metal festivals, including more than 60 bands. . Stratovarius is going to release a new album in late 2010. In May 2008, Timo Tolkki signed over the Stratovarius catalog, the Stratovarius name, and all royalties to Timo Kotipelto, Jens Johansson, and Jörg Michael. *Left the band at the time of the Black Water. Stratovarius live in Tuska, Finland in July 2007. ^ "Wacken Open Air Tour 2010". Metal Call-Out. February 2, 2010. http://www.metalcallout.com/metal-music-news/wacken-open-air-trailer-for-2010.html. Retrieved February 5, 2010. "Future Shock" · "Black Night" · "Break the Ice" · "Wings of Tomorrow" · "Father Time" · "Will the Sun Rise?" · "Black Diamond" · "The Kiss of Judas" · "S.O.S." · "Hunting High and Low" · "It's a Mystery" · "A Million Light Years Away" · "Eagleheart" · "I Walk to My Own Song" · "Maniac Dance" · "Deep Unknown"